Synopsis: Jim Petersen is a film scriptwriter working in Hollywood. Behind with an assignment, he puts his wife Sarah on a plane to New York so that he can concentrate on his work. The plane bursts into flames before it can leave the runway and Sarah is killed. In Paris a short while later, Jim meets a woman called Katherina, a Yugoslav who bears a striking resemblance to Sarah. She asks Jim to take her to Yugoslavia, using Sarah’s passport, so that she can smuggle some valuables out of the country. Lonely and at a loose end, Jim agrees. Once they reach Belgrade, it slowly dawns on him that he has bitten off more than he can chew and that, as well as being foolish, he has imperilled both himself and Katherina by agreeing to undertake the errand. Context: The story was triggered by an actual event: Balchin’s second wife Yovanka arrived in Los Angeles by air and the plane landed heavily on the runway. The rest of the story, especially the treasure hunt at the end, was Balchin’s own invention. 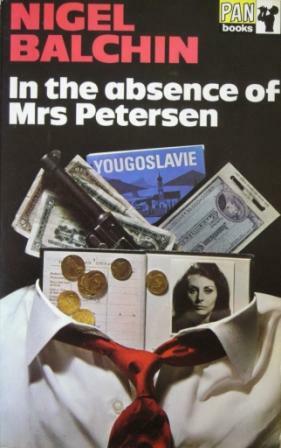 Some critics have described the book as “Amblerian” and it is true that In the Absence of Mrs Petersen does at times evoke the novels of Eric Ambler, in particular 1953’s The Schirmer Inheritance. Verdict: The book takes a long time to get going (and one’s credulity is strained at times) but the ending is undeniably enthralling and in this regard it can be said to rival the novels of Balchin’s heyday. The middle of the book is very slow-moving, being principally taken up with descriptions of the two unsympathetic central characters bickering in hotels and restaurants, which will not be to everyone’s taste. Availability: Not too difficult to find, particularly on the Internet.